A New York technology company is creating a blockchain-based registry of original art and using NFC tags attached to the works themselves to link the physical items to their digital identities. The Blockchain Art Collective says it aims to provide unparalleled provenance tracking capabilities to artists, collectors, dealers, and other institutions by assigning a unique, tamper-evident, and secure identity to physical works of art. 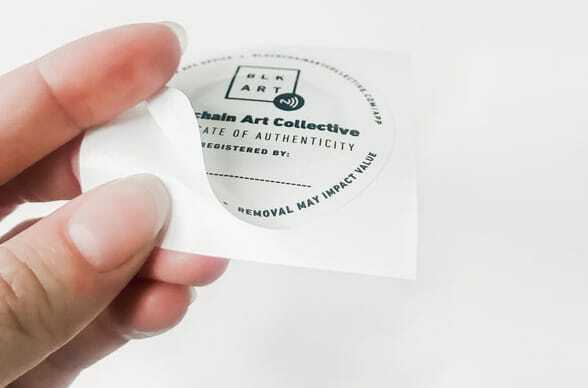 The company, backed by smart supply chain specialist Chronicled, supplies artists with starter kits containing two NFC-based certificates of authenticity for US$20. Details of new artworks are then registered in an app and the associated NFC tag is stuck to the item. Anyone can interact with an artwork by scanning it with a mobile phone that has the Blockchain Art Collective’s app installed, allowing them to see any publicly registered information.